If you’ve ever overlooked the outward appearance only to find yourself perpetually waiting for the inner beauty, then this is the fruit for you! Everything I have read about Quince says they are too tart and astringent to eat raw. This particular variety doesn’t really have those problems, I could eat it if I really wanted to (no noticeable astringency to me), it just doesn’t taste good. 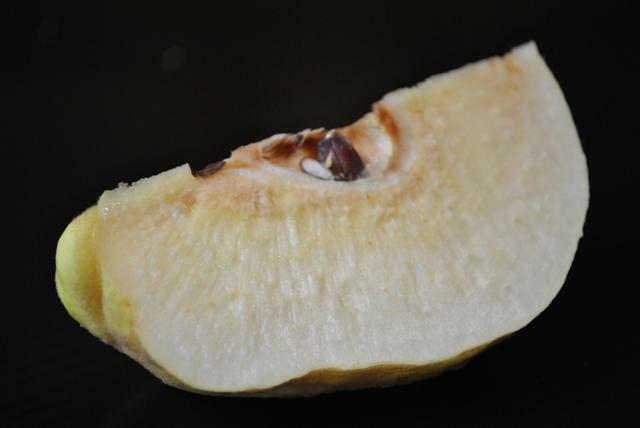 It wasn’t that much more tart than a bad granny smith apple. That being said, apparently quince become all mystical and amazing once cooked, but dare I mention in the third post in a row that I prefer to be lazy and not have to chop and peel and cook and stuff just to eat a piece of fruit. So my apologies dear orange quince (also known as the apple-shaped quince), but you will not be scoring well on the snacking scale today. Lest you think I’ve let you down, (and so I don’t start receiving hate mail from quince lovers everywhere) I did poach these little funky girls. 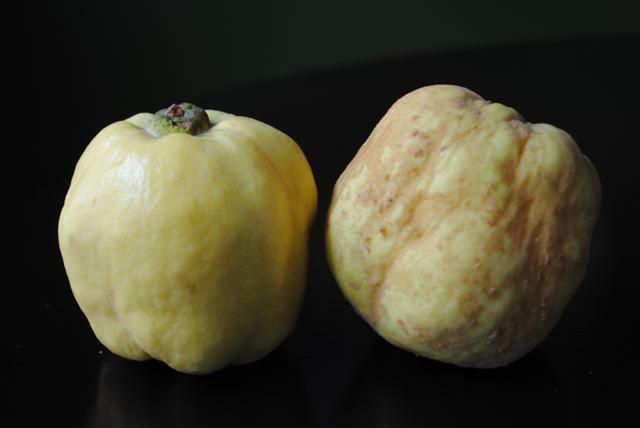 Sadly, I had also heard that quince turn a lovely shade of red when poached, but these did not. They stayed their pale yellow color, which I now know is normal for this variety. They tasted good I suppose with a complicated floral apple taste and a citrus undertone but I just can’t get that excited about them. I even baked them into a free form pie with the hidden rose apples I had leftover. “Eh.” That’s about all I can say about them. I do think I will try another variety though. I’ve just heard too many good things to let them go at one try. I love membrillo & cakes made with some poached quince thrown in, but my favorite way to “eat” them is to make refrigerator syrup with them. Peel and slice the quince in thin wedges, and place in a glass jar. Top with sugar so that all of the quince are covered, cap the jar, and let it sit in the fridge for a week. After one week, shake the jar periodically to distribute the sugar over the quince. In a month or so, the quince will have “melted” the sugar & you’ll have a heavenly fruity syrup to add to tea, baked goods, etc. Oooh! Thanks for the tip Jess. I have some Smyrna Quince right now and I have been wondering what I should try doing with them. I’ll do this tonight. 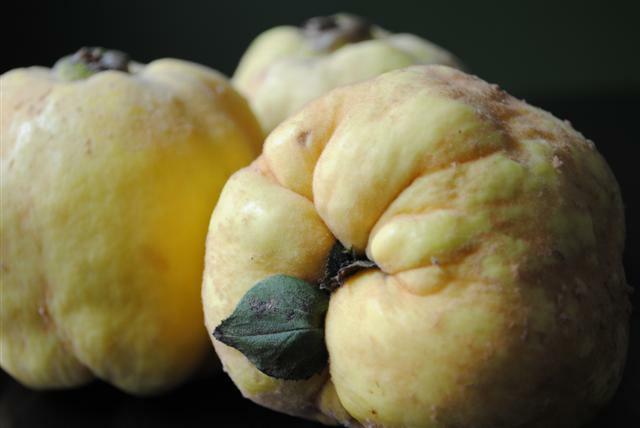 I truly love quince, but you’re right – it’s nearly pointless to eat them raw. For me, I love them the most as membrillo (which I make once a year, in large enough quantities to last the entire year). It’s good as a dessert by itself or with cheese. Or.. .well, anytime. Also, quince jams are wonderful on toast. I know some people who peel, core and slice them then make tarts, but I’m too lazy for such things. Other people put quince in a pot where a roast is cooking (with all the veggies) and I do think they’re quite good that way. Jess, thanks for the tip! What do you do with the fruit once the syrup is gone? Allie, a great way to use the “syrupified” quince is to toss them into a quickbread recipe or muffins. You can use them just like you would blueberries (though the taste would be different of course). Whoever wrote this piece is incredibly ignorant as well as a lousy cook. Quince need to be cooked or bletted. They also are low in sugars, so you need to add sugar. I have made quince jam, quince jelly, quince paste, quince tart, and pomme fruit sauce with quince. They all turn reddish if you cook them correctly. 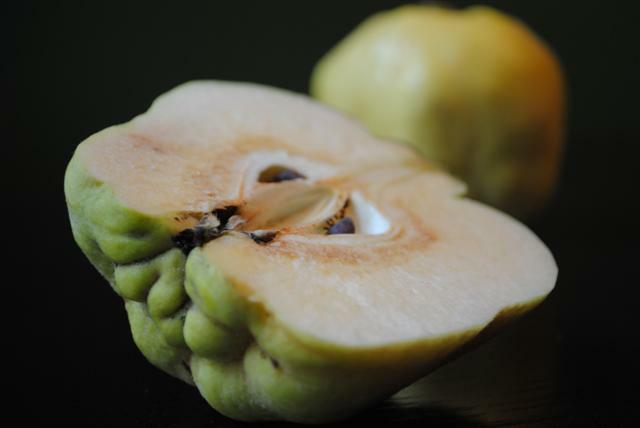 And they all taste fabulous… a haunting aroma that makes you dream of quince, and a taste that is amazingly complex.